At any moment now, the folks at BT are going to cut the cord and I will have no internets until they see fit to connect me up in my new place - and based on my long and wearisome experience with BT I fear that may take, oh, a few weeks on the outside. Factor in Christmas-related inertia and we may be well into 2009 before I'm online again. But the good news is I'm moving to a place with many nicknames. 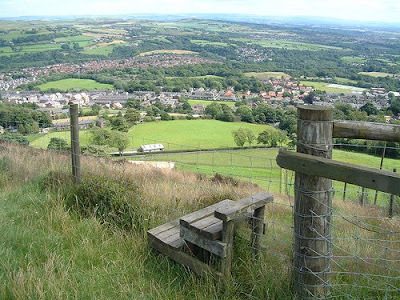 Ramsbottom is also known as Rammy, Rambo and, my favorite, Tup's Arse (Tup is old slang for a ram, oh American readers). It's a Pennine mill town just a hair inside the Greater Manchester border. Which will make me, like, an actual Mancunian. Or something. Good things about Ramsbottom I've found out about so far include the delicious Ramsons, a steam train, the lovely Nuttall Park and an eerie chippie called The Wayward Tyke. Anyone in Ramsbottom? Give us a shout. (Ramsbottom photo from Flickr user topdogdjstew. Yay, welcome to the centre of the universe ;-) Rammy is a fab place to live. Other good stuff about the town includes China Cottage for yummy food and the gorgeous and lovely Leo, the farmer's markets, a fabulous toy shop, winter walks to the top of Holcombe Hill and Lancashire Sauce from Entwistle's Deli. Oh, and having a panoramic view over our own personal wind farm. Good luck for the move. We have plenty of snow (and slush!) today so bring wellies! Awesome, thanks Mama B! I was wondering if China Cottage was any good - we're only down the road. That's our first takeaway sorted then. Buddha Lounge is the place to eat. Totally divine. Room 54 is petite but does good cafe food. The Lounge isn't bad for a coffee although the choice of cakes is minimal. Caramel for hair and beauty. Traditional sweet shop for all those old favourites. And the craft shop opposite the railway is fab. Summerseat garden centre, a station away on the ELR, is great for plants and they do good food and coffee too. I'm not far away, by my rudimentary estimations. When I used to come up to Manchester as a child my sisters and I would always be gleefully scandalized by the name Ramsbottom, and as a result I always want to stifle a giggle when I see it written down. Oh, thanks to all of you for your advice. I love Rammy already. maybe see you around? And Diane, I am writing this from the library. Grrr. Hi My names cath and I own the Sweet shop in Ramsbottom. Drop in and see all your old favourites when you get chance. As a matter of fact, I'm going there tomorrow night. I've been before and the food is lovely, and they have great beer.